Lightly battered cauliflower pieces topped with sunflower seeds, feta cheese, pickled red onion, and an herbed green goddess tahini sauce. Combine rice flour, baking powder, sugar, salt, and sumac in a bowl. Add sparkling water to flour mixture. Dredge cauliflower florets in batter and deep fry, until golden brown. Combine water, vinegar, and sugar in a sauce pot. Bring to a simmer and pour over red onions in a seperate bowl. Let red onions sit, in pickling liquid, for at least one hour. Blanch parsley and cilantro in a small pot of simmering water. Cool in an ice bath. Remove herbs from liquid add them, and tahini, mayonnaise, garlic, and vinegar to a food processor until pureed. Add water to reach desired consistency. 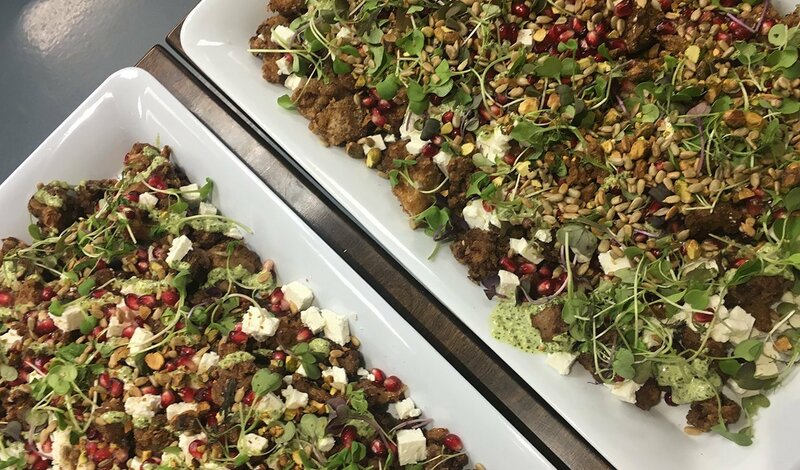 Divide crispy cauliflower into 10 portions and top with green goddess tahini sauce, feta cheese, sunflower seeds, and pomegranate seeds.